Lot Detail - Tom Chorske's Late-1980s Montreal Canadiens Game-Worn Rookie Era Jersey with Team LOA - Team Repairs! Tom Chorske's Late-1980s Montreal Canadiens Game-Worn Rookie Era Jersey with Team LOA - Team Repairs! Appearing for seven different NHL clubs during his career, Tom Chorske would score 237 points over 596 games, with international appearances also made for Team USA on a number of occasions. 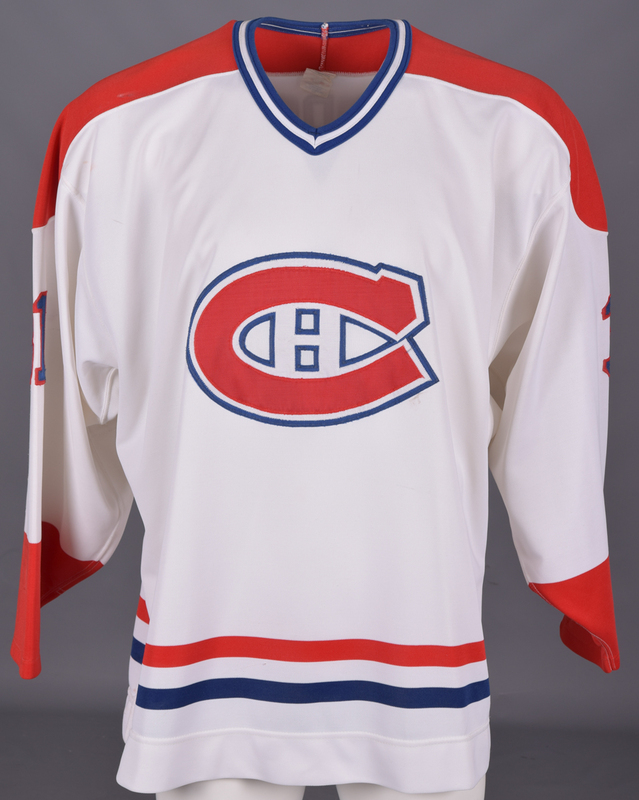 We have a Montreal Canadiens jersey from circa 1987-89, recycled for Chorske during his rookie era in either 1989-90 or 1990-91, with the possibility of preseason use. With no clear evidence visible of a former nameplate, a faded Maska Ultrafil label remains affixed to the collar. Measuring-out to roughly a size 52, embroidered CCM and NHL crests have been placed over the reverse bottom hem. 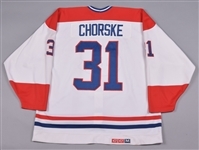 Styled with the most famous team crest in hockey, “31” appears over the sleeves and verso in blue-over-red tackle twill, with “Chorske” across the affixed nameplate in single blue twill. Scuff marks and burns are visible over each lower sleeve, with some red paint transfer over the reverse hem and near the right elbow. There are also 3 team repairs situated over the left sleeve, with pilling to the interior sleeves and beneath the fight strap. A team LOA will be included, signed on behalf of the Canadiens by Rejean Houle.